Johanna Konta believes her new coach Michael Joyce can help restore her mental toughness and steer her closer to winning a first grand slam. Joyce, best known for coaching Maria Sharapova, began working with Konta in November before the American was confirmed officially as Wim Fissette's successor last week. 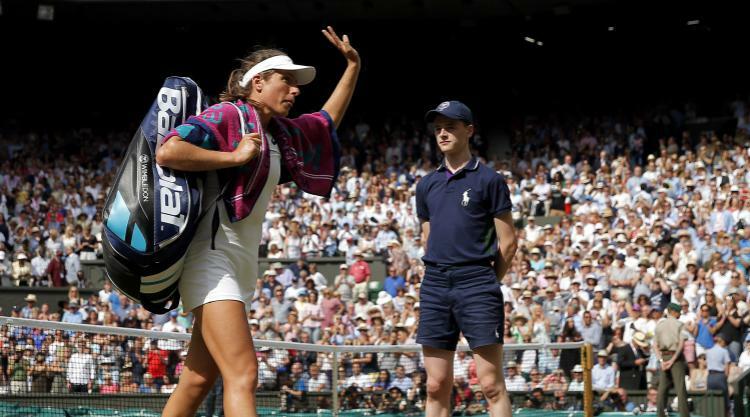 Konta split with Fissette after a miserable end to the season, which included four consecutive defeats, despite an excellent year more generally as the Briton climbed to world number four and reached the semi-finals at Wimbledon. A foot injury, which she says has now healed, combined with mounting off-court commitments had caused Konta to feel burned out and she admits part of Joyce's remit is to provide a clearer sense of purpose. "I think I definitely lost my way a bit with that in the second half of the season," Konta told Press Association Sport. "I think I'm at my strongest when I'm clear on the direction I want to go in and the improvement I want to see happening. "I like to think with each step I take and experience I go through I become better equipped to play for major titles. Working with Michael is a step in that direction. "He fits well into what I need and I'm looking forward to building a long-lasting working relationship with him. He definitely has a lot of things I can bring to my game." Joyce, however, will be only too aware that Konta has now dispensed with her coach at the end of the last two consecutive seasons. Her hitting partner Andrew Fitzpatrick has also left the team. "Andrew and I had a good relationship and still do," Konta said. "It was a natural expiration of that relationship as well. It was just time to have a different set-up." Joyce achieved a career-high ranking of 64 as a player and, apart from the occasional tournament next year, the 44-year-old will travel full-time with his new charge. Konta is now into week five of her pre-season, with the pair expected to link up for their first official competition in Brisbane at the start of January, ahead of the Australian Open. "I know I always talk about the process but there are very much certain things I hold dear to me," Konta said. "There are certain values that if I'm ever hiring someone for a role I need to make sure they are aligned to the same things as me. "That's only ever going to be a first step and Michael passed with flying colours. As a man he seems like a great guy and I'm enjoying him spending time with me and the team. "He brings so much experience as a coach and player. He was a former player himself and a very good one at that so the combination of those things is very valuable and important to me." Konta now has her eye on Sunday's BBC Sports Personality of the Year ceremony after the world number nine was included on the 12-person shortlist. She has also continued her love of baking in recent weeks away from the tour and tweeted a completed application to next year's The Great British Bake Off competition on Channel 4. "That did happen, it was real. I don't joke about baking!" Konta said. "I haven't heard back although I think it would be difficult to schedule with my commitments if I did make it through. "But if they would have me I'd definitely love to do it. Just - no offence to the Bake Off - but I would rather win a slam, although the prestige is probably similar for both."